This lithograph is taken from plate 1 of 'General Views of Lucknow' by Sir DS Dodgson. Nawab Asaf-ud-daulah of Lucknow conceived a large European design for the British Resident at his court in 1780, and this building was completed 20 years later by Nawab Saadat Ali Khan. It stood in the northern part of the city on what was then the highest elevation in Lucknow. During the 1857 Indian iprising, the Chief Commissioner Sir Henry Lawrence chose to withdraw with a small British garrison and all Europeans in the vicinity to the Residency and make a stand there. 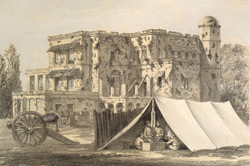 Thus began the famous siege of Lucknow. The beleaguered group held out alone for three months, and despite the arrival of a relief faction it was besieged for a further two months. Under the ruins in the nearest part of the sketch, six soldiers were buried alive when the shell-battered walls fell in upon them. Two pieces of wood flank the door of the first-floor room in which Lawrence was mortally wounded by a shell fragment.